Explain what a process is? 1. Explain garbage collection in .Net? There is a managed heap for each managed process, the heap is initialized by the garbage collector. The garbage collector calls win32 VirtualAlloc to reserve memory and VirtualFree to release memory. More suitable for long-running desktop applications, adds support for concurrent garbage collection which should mean that the application is more responsive during a collection. 2. What is boxing / unboxing? Boxing occurs when a value type is passed to a method which expects an object or a value type is implicitly cast to an object. Unboxing is the reverse of this process, taking an object and casting it back to the value type. Yes there is a performance cost when an item is boxed a new item must be created and allocated on the heap, 20x as long as a simple reference assignment. 4x penalty for unboxing. 3. What is a struct, when should you use one? 4. What are weak references, why do you need them? Enables you to take out a reference to an object without stopping the garbage collector from reclaiming that object. Useful if you have very large objects, which are easy to recreate. 5. What is the dispose pattern? The dispose pattern is used only for objects that access unmanaged resources. The garbage collector is very efficient in reclaiming memory of managed objects but has no knowledge of memory used by unmanaged native objects. 6. What is the difference between a Dictionary<TKey, TValue> and Hashtable? Note that internally dictionary is implemented as a hashtable. 7. What is the cost of looking up an item in a Hashtable? 3. What are some lock-less techniques for avoiding race conditions? 4. What is does the keyword Volatile mean or do? It ensures that the value of the field is always the most up-to-date value. Commonly used in multi-threaded applications that do not use locks to serialize access to shared data. When using a lock it causes the most up-to-date value to be retrieved. Values can become stale when threads run on different processors asynchronously. 5. What is differenct between ManualResetEvents and AutoResetEvents? When signaled via ‘Set’ threads waiting can all proceed until Reset() is called. With auto reset event only one waiting thread is unblocked when signalled ‘Set’ and the wait handle goes back to blocking other waiting threads until the next ‘Set’ message is sent. IObservable<T> is a collection of things that can watched and defines a provider for push-based notification. And must implement a subscribe method. Ensure a class only has one instance, and to provide a global point to access it. Attach additional responsibilities to an object dynamically keeping the same interface. Decorators provide a flexible alternative to subclassing for extending functionality. an object should have only a single responsibility. “software entities … should be open for extension, but closed for modification”. “objects in a program should be replaceable with instances of their subtypes without altering the correctness of that program”. See also design by contract. one should “Depend upon Abstractions. Do not depend upon concretions.”Dependency injection is one method of following this principle. Part of the official .Net 4.0 framework release. WCF WebHttp Services is the flavor of WCF that is most appropriate for developers who need complete control over the URI, format, and protocol when building non-SOAP HTTP services— services that may or may not subscribe to RESTful architectural constraints. This project focuses on allowing developers to expose their apis for programmatic access over HTTP by browsers and devices. Essentially this is a continuation of work done on the WCF Rest starter kit, and could be considered as a preview of wcf http services for .net 5.0? The new WCF Web Api’s recently announced at PDC replace the REST Starter Kit and provide significant enhancements including better access to HTTP, more flexibility with representations and support for jQuery. Please go to http://wcf.codeplex.com/ for more information. OpenRasta is a development framework targeting the Microsoft .NET platform for building web-based applications and services, and distributed under an Open-Source MIT License. By focusing development around resources and HTTP methods, OpenRasta simplifies the creation of ReST-friendly interfaces. 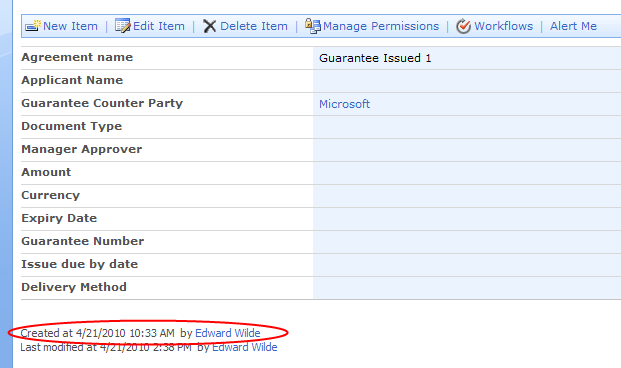 Today I had the requirement to add custom validation logic to a SharePoint edit form. The edit form is being displayed using a ListFieldIterator. 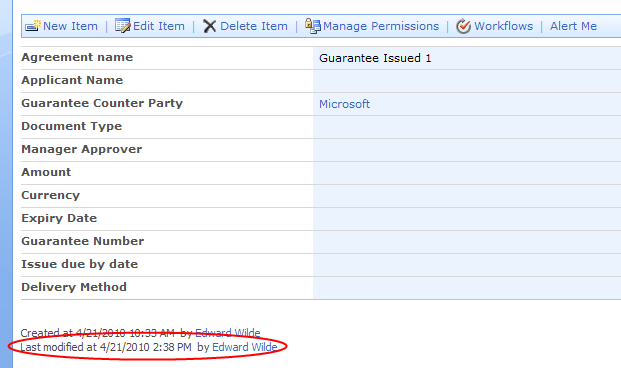 The requirement was to make sure the Date field could not be set to a date in the past. The solution (Other solutions are available and are most probably better!) I came up with involved subclassing ListFieldIterator and attaching ASP.NET validators at run-time. How do you attach a ASP.NET validation control at run-time. Attach the validator at the correct stage of the page/control life-cycle. In the case of the ListFieldIterator I wanted to attach it after the control had build it’s control tree. Override CreateChildControls, call base, then attach. Sometimes it’s useful to overwrite the created by and last modified by fields and get rid of that pesky ‘System Account’ ! Cannot change the lookup list of the lookup field. Once a lookup field (SPFieldLookup) has had it’s LookupList and LookupWebId set you can’t change them. Okay so ever needed to see if a particular web or site feature is activated? Well if it’s activated it will be in the SPWeb.Features SPFeatureCollection or SPSite.Features. If it’s not activated it won’t be. Simple. To check if a feature is installed examine the feature definitions collection on the SPFarm object, below are a couple of little extension methods that demonstrate this concept. Okay so its pretty easy to get the fully qualified domain name (FQDN). /// Defines extentions made to the <see cref="Domain"/> class. XslCompiledTransform !♥ the UTF-8 BOM : System.Xml.XmlException: Data at the root level is invalid. Line 1, position 1. Recently I came across a rather annoying issue with the XslCompiledTransform class. Namely it really doesn’t like having a BOM (byte order mark) shoved down it’s load method. System.Xml.XmlException: Data at the root level is invalid. Line 1, position 1. /// Removes the byte order mark. /// The bytes. /// byte array without the BOM. /// Determines if the byte array starts with a byte order mark. /// The bytes. /// true if the byte array starts with a byte order mark; otherwise false.